When all else is equal, those who can manage Ground Reaction Forces optimally Feel, Move, and Perform Better. UpRight Movement helps change lives for the better through education focused on health, pain-free movement, and performance. At UpRight Movement, we are dedicated to providing post-rehab, injury reduction, and performance training for people who live life to the fullest. Major focus is placed on decreasing injury risk and enhancing performance of those in the game of life and other athletes in sports. UpRight Movement is a developmental-based movement approach informed by functional anatomy, human biology and Newtonian physics. We believe these are the non-biased constructs and confines within which the human body operates. UpRight Movement is influenced by the injury rehabilitation and sports performance fields, bringing a seamlessly integrated approach that bridges the gap between rehabilitation and performance. 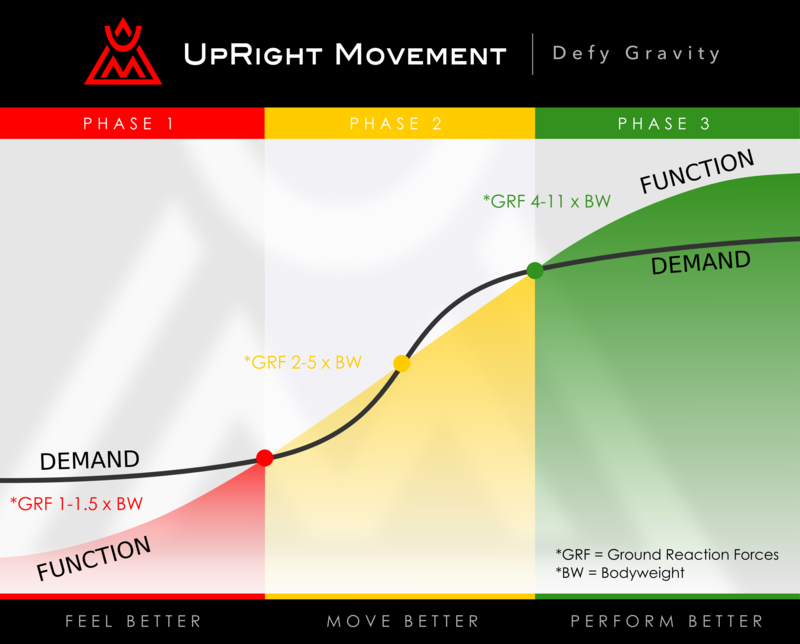 UpRight Movement values an intelligent systematic approach of checks and balances qualifying movements for precision and clean movement mechanics. There are three clearances that we adhere to prior to advancing you: Pain, Quality and Quantity. What makes UpRight Movement so different and successful? UpRight Movement takes a holistic approach, looking at the beginning, middle, and end points of movement. We consider a hierarchy of movement that is built upon the foundation of mobility (flexibility + strength) and stability (reflexive resistance to change, e.g., in walking gravity attempts to pull us down while we resist and stay upright). This foundation involves musculature that is functionally more postural in nature with finer motor control, and from which gross muscles and movements operate. When these essentials are in place they provide efficient support to higher demand activities, minimizing over compensation of movement and reducing injury potential. Expected outcome: improved results. UpRight Movement also considers the other remaining hours within the day, and the other variables and stressors that may take away from your results. It is vital you consider recovery just as important as training, for they are interdependent. Regeneration: It is important to understand that everything in the system will break you down and this is the time when we educate and execute regeneration strategies to ensure optimal performance during future training sessions. What does UpRight Movement not do? UpRight Movement does not fix people. UpRight Movement takes a big picture view in the beginning with intake. Our formula: An Individual’s Abilities + Expected Movement Demands = Proper Movement Based Planning. Strategies are recommended to help address abilities and demands. It is paramount we work these strategies, so that they work for us. Training for real, sustainable results is a process requiring consistency over time. Usually the longer and greater an imbalance has been established the greater our need for consistency. UpRight Movement DOES have the knowledge, the tools, and the dedication to support you. In Phase 1: Feel Better; we utilize a “restorative activation” process to develop structural integrity. We emphasize the essentials of mobility, stability, posture and efficient movement. Expected outcome: Feel Better. Safety throughout the process (exercise does not need to be distressing). We continually monitor your technical proficiency, intensity, volume, and regeneration. In Phase 1: Feel Better; we use a restorative activation process to improve the integrity of your body. We focus on mobility, stability, posture, and efficient movement. Reeducation and development of optimal posture and efficient movement patterns. Restorative exercises that focus on postural muscles and early-developmental movements. Reactive stability. We focus on stability of the spinal, lumbar and pelvic regions. In Phase 2: Move Better; we utilize an integrative full-body movement process to improve coordination and load-bearing. We focus on movement health and fitness integrity prior to placing your body under more stress in Phase 3. Expected outcome: Move Better. Preparation for the Phase 2: Move Better Fitness Standards Test. In Phase 3: Perform Better; we utilize an integrated performance process to develop physical and athletic integrity. We focus on managing ground reaction forces and improving functional thresholds. Expected outcome: Perform Better. In Phase 3: Perform Better; we use a five-stage process to help restore, improve, or maintain both performance integrity and the ability to manage ground reaction forces throughout your body. Durability Training: Durability helps to optimize neuromuscular efficiency, joint position/function, and maximize muscle regeneration. Durability training targets key load bearing regions of the body that are the most prone to injury, such as the back, hips, shoulders and knees. Performance Standards Test: A series of accurate, reality-based movement tests designed to determine the functional ability of your body. Each test demonstrates your ability to perform the movements (both Fitness and Performance) necessary to move through your life without being vulnerable to injury. If any of these movements are difficult or not currently possible, we are able to develop specific routines that help you to safely restore, balanced movement patterns. Developing strength and power. Once in the weight room it is important to develop strength within the boundaries of quality movement. We need to train at the speeds, loads, and movements appropriate for your abilities or sport/position. Developing plyometrics. As the bridge between strength and movement skills, plyometrics are the key to developing powerful movement patterns. This stage involves low quantity, high quality work to teach you how to improve power production and the rate of force development. Energy system development. We evaluate your requirements, assess your conditioning relative to those demands, and improve your capacity with appropriate movements in a fun and challenging environment.